Evalyn Parry explores the many meanings of the bicycle in SPIN, on now at Buddies in Bad Times Theatre. Detail of a photo by Tanja-Tiziana. Mostly everyone shares a similar first experience with a bicycle: a push, a wobble, then the unadulterated glee of one’s first brush with independence, hair flying in the wind. That was Evalyn Parry‘s (Breakfast, Clean Irene & Dirty Maxine), at least, and that’s how she introduces her newest project, SPIN, which had its preview last night at Buddies in Bad Times Theatre. But by the time Parry has finished her ninety-minute examination of the two-wheeled machine⎯spanning a century in time, three historical feminist icons, an infamous Toronto bike thief, and her first heartbreak⎯the bicycle, it turns out, was never that simple. Despite such innocent beginnings, it’s hard to imagine another object that is currently as divisive as a bicycle. A bike helmet under one’s arm is regarded as much of a political statement as a check on a ballot. It makes someone “eco-friendly” or “self-entitled,” “health-conscious” or “shark bait,” “progressive” or “a left-wing pinko,” all depending, of course, on whether or not one actually regularly rides a bike. But in SPIN, Parry, a lifelong biker and unabashed pedal-pusher, broadens the breadth of roles a bicycle can play, in both a historical and personal sense, to a scope we never thought possible: to her, a bike is an agent of physical and social mobilization, a metaphor for shopping and commercialization, a confidante, a trusty steed, a memory bank. The Bicycle is a costar in her life, and a costar in the show, too. Drawing upon her experience as a musician and spoken word artist (she’s got four albums, the latest being the music from SPIN, which was released at last night’s preview), Parry finds one more unexpected role for the bicycle⎯as a musical instrument. On stage, suspended from a mechanic’s stand is an old 1972 CCM Galaxy, decked out in contact mics, turning the seat into a snare drum and the spokes into a violin. 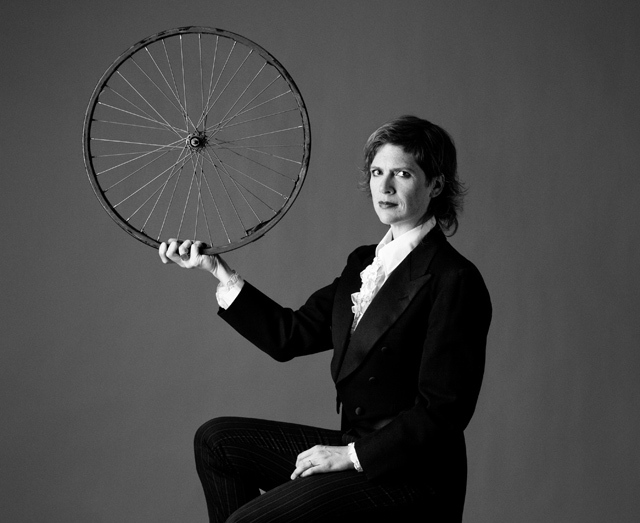 Accompanied by Brad Hart on the bike and Anna Friz on a variety of other musical contraptions, she recounts the stories of nineteenth century heroines Amelia Bloomer (promoter of pedal-friendly pants), bike advocate Frances Willard, and most prominently, Annie Londonderry, the first woman to bike around the world. While connecting them with her personal relationship to the bicycle through an ingenious mixture of songs, monologues, video projection, and modern technology, Parry reminds us that life, as a bike, is propelled forward by the power of what’s behind us. The songs are actually pretty catchy too (the Parrys are a musical family⎯her brother is Richard Parry of The Arcade Fire). In fact, the depth Parry gives to the concept of the bicycle through her script is quite staggering. Even the title, SPIN, applies to several scenarios, from the spinning of the bicycle wheel, to the spin of feminine stereotypes by Londonderry, to the spin Parry uses for self-promotion, the spin of bike politics, and the spinning of Parry’s head after she’s hit by a car. The discovery of these connections within the finely crafted script are fascinating to track, and with all the different elements of instruments, video, costumes, lighting, and staging, director Ruth Madoc-Jones and production designer Beth Kates perform a commendable job of keeping the brakes on so that the show doesn’t start spinning completely out of control—even if, at points, the motion of Parry’s rhythmic rhyming takes on a path of its own, losing us momentarily. Friz, Hart, and Parry form a whimsical rag-tag team with a sharp comedic touch, but overall the play is still heavily political. Parry says it’s an argument for Rob Ford to understand the importance of the bicycle to Torontonians, at a point when the future of cycling in the downtown core appears mixed (Bixi announced it will unroll on May 3, while confusion remains over the status of Bike Month). For some people, a bike will always be child’s play, and Ford (who has been invited to attend the show) may always think of bikes as fish among the sharks. But as we leave the theatre and see others ride down Yonge Street on their two-wheelers, we find ourselves wondering what their bike means to them, which is definitely a good way to get the conversation started. SPIN runs until March 27 at Buddies in Bad Times Theatre (12 Alexander Street), Wednesday–Sunday at 8 p.m. Students $16, Regular $20.